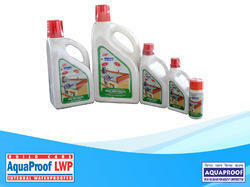 Aquaproof LWP makes concrete resist water even through hydrostatic pressure or capillary absorption. This is done by disrupting the capillary network within the concrete,thus making the concrete impermeable. It also reduces water demand significantly. AquaSeal is cement based so it is eco-friendly and non-flammable. 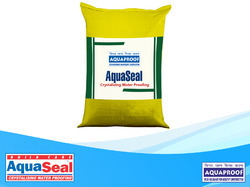 AquaSeal can be applied for both positive and negative water pressure. Since it is non-hazardous, AquaSeal can be applied in potable water tanks too. AquaSeal is a do-it yourself product. It does not require skilled labour. AquaSeal contains crystallizing agents that remain active for a very long period thus prevents water leakage in the future too. Aqua Gard is a flexible, acrylic polymer modified, cement-based, two component waterproofing coating. Aqua Gard can be applied over concrete and masonry surfaces. 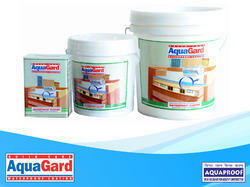 Aqua Gard is easy to use and economical. This system comprises cement-based white powder and acrylic polymer in liquid form both supplied in pre-measured quantity. Aqua Gard can be applied by ordinary brush. 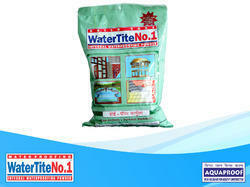 Water Tite No.1 is a chloride free powder, which seals the capillarypores of concrete and cement mortars thereby blocking water seepages. It is water insoluble, and therefore becomes a permanent constituent of hardened concrete. Water Tite No. 1 also increases work ability. Can be used for concrete as well as mortars. effectively. Dose not contains lime stone powder. Packed in durable pouches-no pilferage like other waterproofing powder. 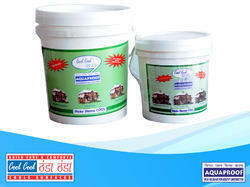 Aqua Crete 151 is a white colour liquid acrylic polymer latex specially designed for use as an admixture for cemetitious mortar and concrete to improve the bonding, flexibilty and workability. It can aslo be used as bonding coatand for excellent waterproofing in combination with cement for increasing the bond between new concrete with old concrete, plaster repairs and screeds. Easy to use. Just add normal OPC 53 cement at site. Very good for joint of new and old concrete. Aqua Damp Proof is an optimal blend of high quality acrylic binder,premium grade pigments combined with Rheology Modifiers and Water Proofing Chemicals. This provides excellent waterproof, tough and flexible decorative and protective coating. Single component, ready to use material, available in white-base. 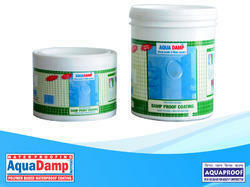 Extremely good water proof and weather proof and can be applied on damp surface. Seals all hairline cracks, pores etc. on surface. Excellent adhesion, withstand expansions contraction, movements of plastering/concrete surface without deforming, cracking, softening and peeling. 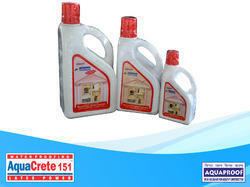 Resistant to mild acids, detergents and fungus etc. Easy to use brushable and also economical. Cool Cool Thanda Thanda is a revolutionary single component white colour powder coating material with excellent properties. Aquaproof Cool Cool Thanda Thanda when applied on any surface effectively reduces the temperature. It also fills minor crackswhich stops leakage. It can also be used to seal plumbing/other joints. A unique formulation makes the product very effective. Reduces your indoor temperature and make you Cool Cool. Protects your building surfaces from leakage/seepage. Extends the life of your roof and other surfaces. Reduces temperature of water in storage tanks. Increases life of slab by protecting reinforcement steel. Simple & easy to apply, can be applied by low skilled painter. Applied by painting normal brush. Durable & low coast coating with added advantages of crack seal and waterproofing.